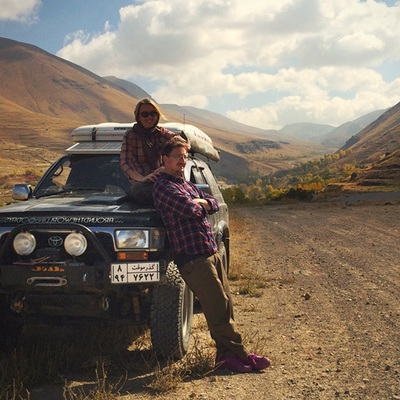 The Overlanding Podcast is dedicated to vehicle dependent travel. In each episode we’ll be meeting adventurous people who have chosen to travel the world by bicycle, motorcycle, car and truck. Each week we’ll discover what motivates people to embark on life changing journeys. 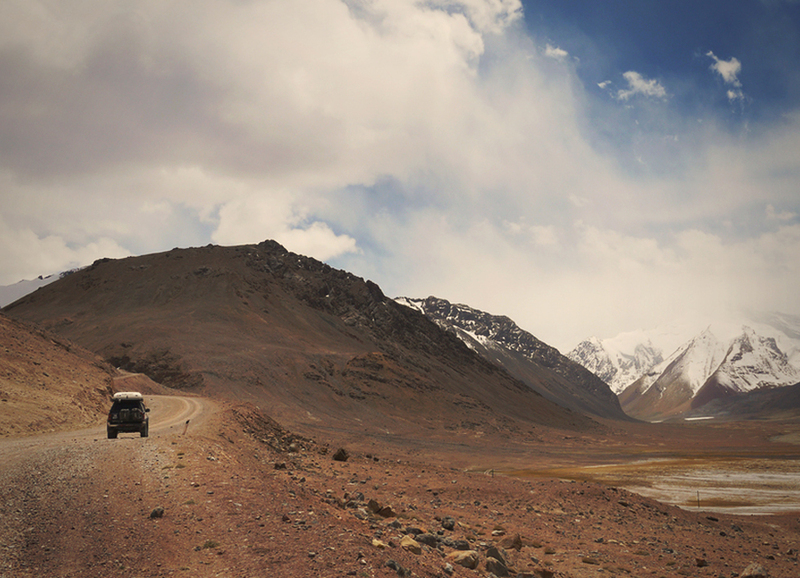 No doubt there will be high drama, tales of amazing hospitality and incredible stories from the road less travelled. ​Whether you are on the road or planning a trip of your own we’d love you to come along for the ride with us! You can listen to the podcast by clicking the square photos below or you can listen and subscribe on iTunes, Stitcher, Android, T​unein and Libsyn. You can also access the RSS feed directly. 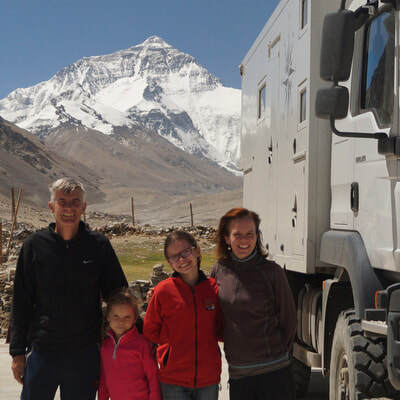 #030 – Steve and Gilly Snaith took their two children, Alisha and Lucy, on an incredible 4-year journey through 58 countries, proving that kids are no excuse not to take an extended overland trip. 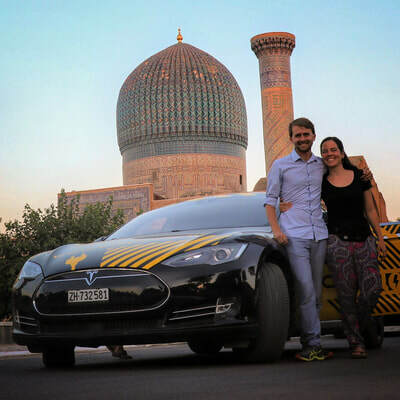 #029 - In this fascinating, inspirational episode I catch up with Benedikt and Magda from E-Explorer as we talk about their less than conventional adventure around the Caspian Sea. 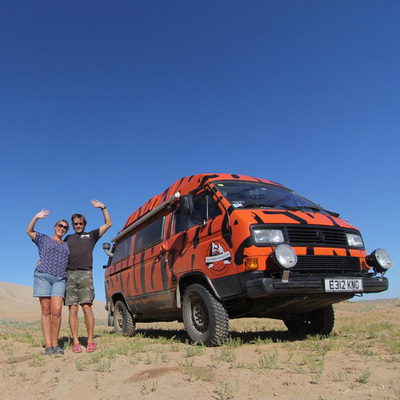 #028 - Will Snyder and Amy Cannon join me at the Adventure Overland Show in Stratford Upon Avon to chat about their 8-month trip, with Caesar – an ex-MOD Landy, from the UK to South East Asia. #027 - No guests on this week's podcast. Instead Andy talks about the apps and maps they used on their Around the World in 800 Days adventure. 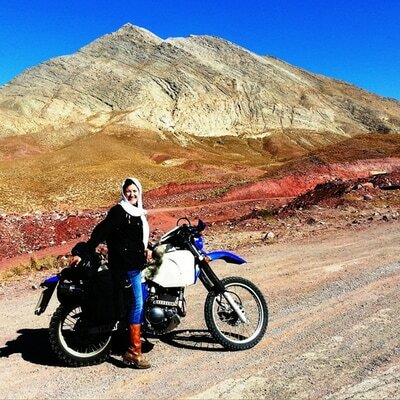 #026 - Motorcycle overlander and Adventure Travel Film Festival host, Lois Pryce, talks about her adventures in Iran. 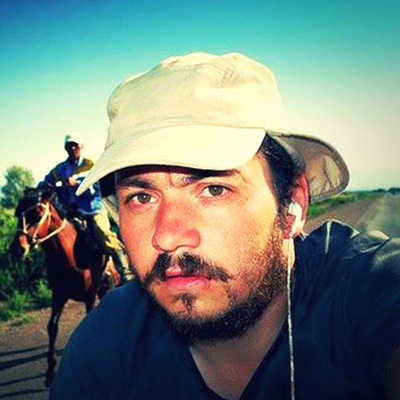 #025 - Adventure biker Nevil Stow runs the website MotoExped and the 9 Minute Moto Film Festival. 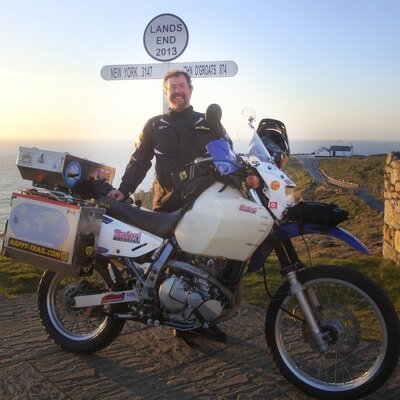 He’s travelled extensively through North America and Canada as well as riding around the world. #024 - Jayne and David have been travelling the world for the last 8 years under the guise Lizzybus. 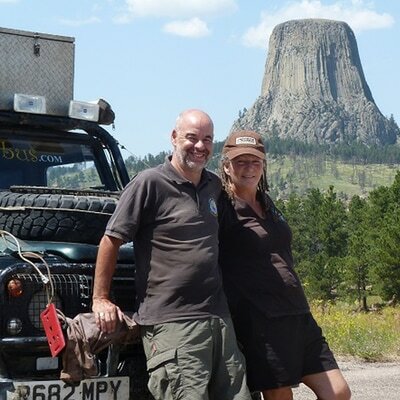 Lizzy is a 110 Land Rover Defender and has carried Jayne and David through more than 80 countries. 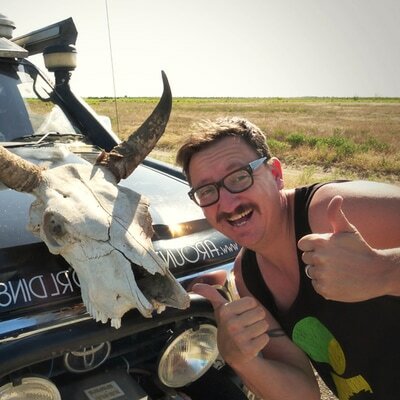 #023 - Jed’s passion for Syncros has organically grown into the website Campervan Culture, and in the process he’s inadvertently created a little sub-culture within the overlanding community. #022 - After spending 5 years living in Asia, Pip Stewart decided it was time to come home, so she cycled back. 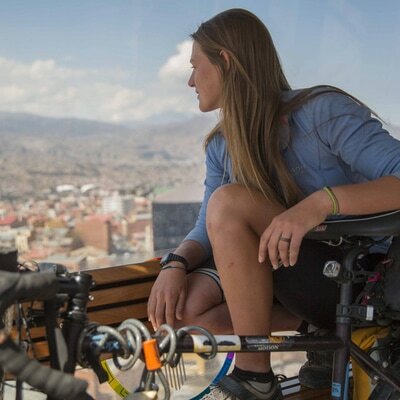 Late last year Pip cycled through Brazil and Peru to raise awareness of the plight of the Amazon forest. 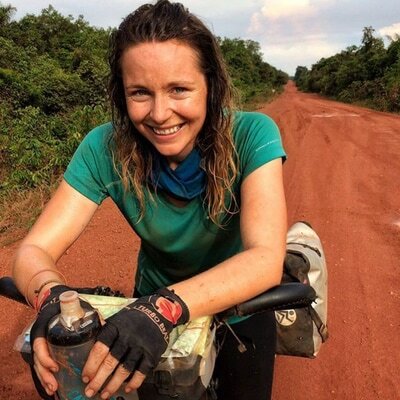 #021 - Laura Bingham set off on an extraordinary adventure to cross an entire continent by bicycle without any money. Little did she know before she set off into this moral minefield, how challenging it was going to be? #020 - Doctor Stephen Fabes waved goodbye to his colleagues at the Hospital and set out on a six-year journey through 75 countries. His first stop was a pub where he spent several hours pondering his decision. 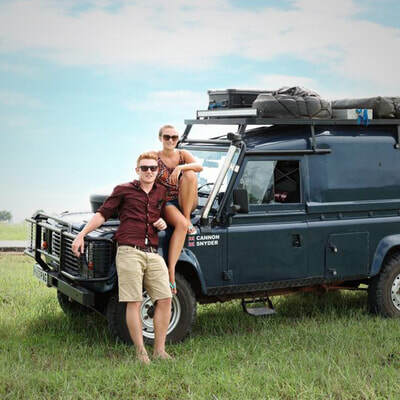 #019 - I catch up with Graeme and Luisa Bell from A2A Expedition and we discuss travelling as a family, keeping it real and the trials and tribulations of writing, publishing and selling a book. 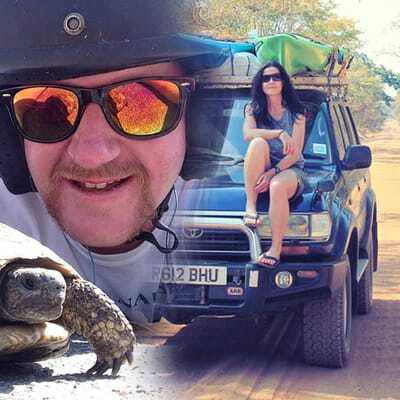 #018 - No guests on this week’s episode, instead Andy talks us through 10 things he’s learnt as an overlander on his ‘Around The World in 800 Days’ trip. 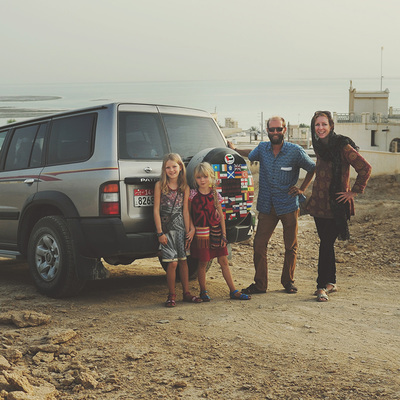 #017 - In this episode I chat with Shara Dillon who drove solo from the UK to South Africa in her Toyota Landcruiser. Ed Gill sits in, as we discuss overcoming major obstacles before you’ve even left and many other subjects. #016 - Graham Field became obsessed with the TV game show Deal or No Deal, to the point where he just had to appear on it. 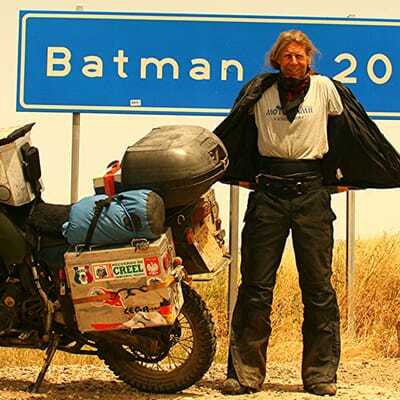 He won £5000 and declared he was going to ride his motorbike to Mongolia and that is just what he did. 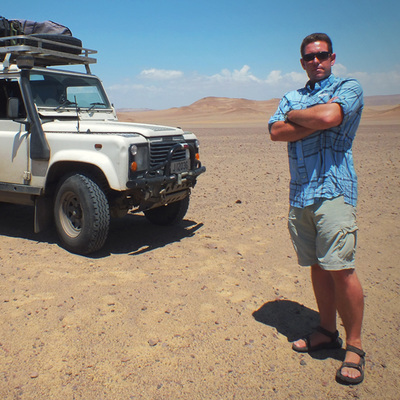 #015 - Mark White, who over the years has focused all his overlanding energies on really exploring one area, Morocco, is an aficionado on this frequently visited overland destination. 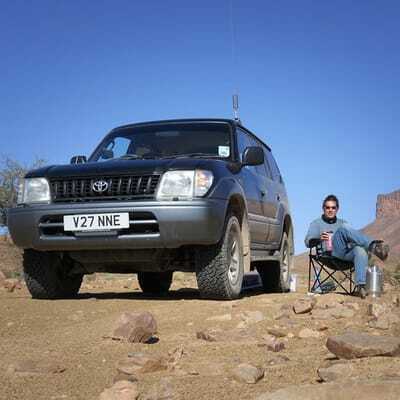 #014 - Gareth Griffiths under the guise of Sirocco Overland has many years experience of Overland trips. When he and Lisa Grubb, decided to emigrate to Australia from the UK what better way than to drive. 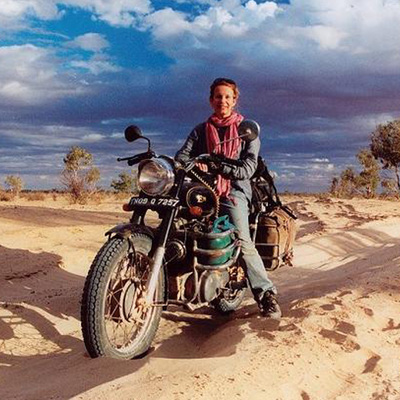 #012 - Jacqui Furneaux, on her 50th birthday bought a 500cc Enfield Bullet in India and embarked on a 7-year adventure. She experienced broken bones, pirates and a few near death experiences. 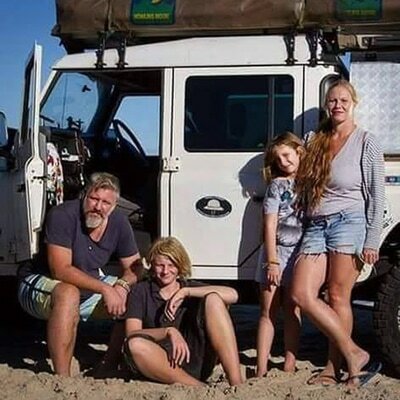 #011 - Kirsty Larmour discusses the merits of travelling with kids, how they “prepared” for the trip, how the kids process and interpret their experiences and whether life on the road is beneficial to a child’s development. 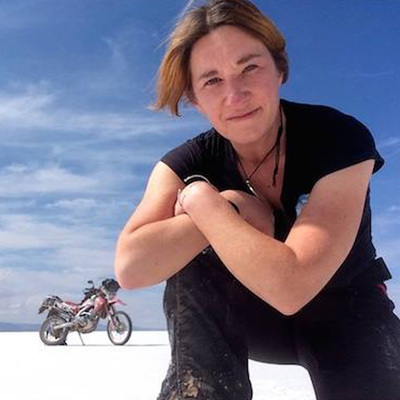 #010 - Motorcyclist Steph Jeavons and I talk about travelling through all 7 continents, the challenges of India, the benefits of travelling on your own and what happens when you run out of money. 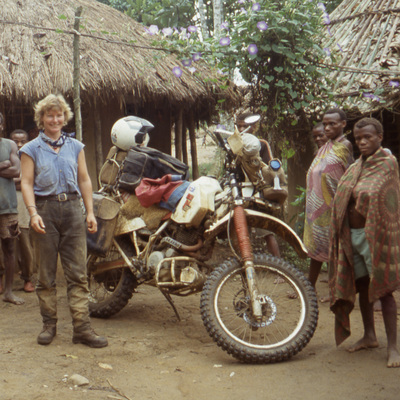 #009 - Heather Ellis and I talk about her book ‘Ubuntu’ which chronicles her solo journey through Africa on her Yamaha TT600 in the 1990’s. Starting with a light-bulb moment her story has twists and turns like the roads she rides. 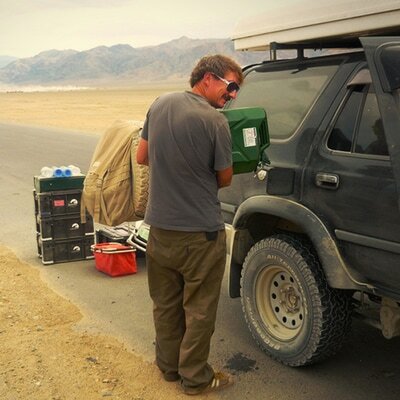 #008 - We chat to Jason Hamasu from Oregon Trail Off-Road about their 44 day challenging expedition retracing the historic Oregon Trail through 6 states. Their route followed the original wagon trail set out by pioneers in the 1800's. 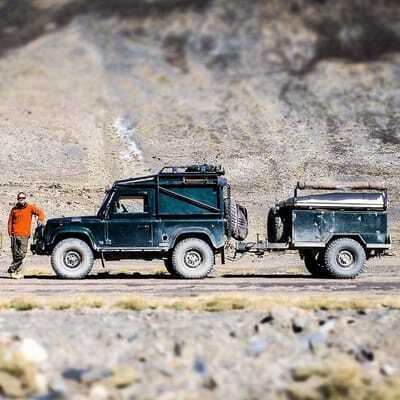 #007 - Motorcyclist Ed Gill and 4x4 filmmaker Jon Beardmore discuss their adventures that took similar routes through Central Asia. We talk about “winging it”, lessons learnt, logistics, staying safe, politics and life on the road. 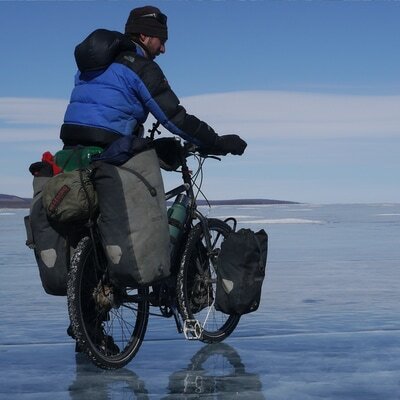 #006 - Andrew Rogerson AKA The Cycling Scouser talks about his epic bicycle ride from Shanghai to Liverpool. The conversation covers cycling uphill, bad Chinese food, being held at gunpoint and football hooligans. 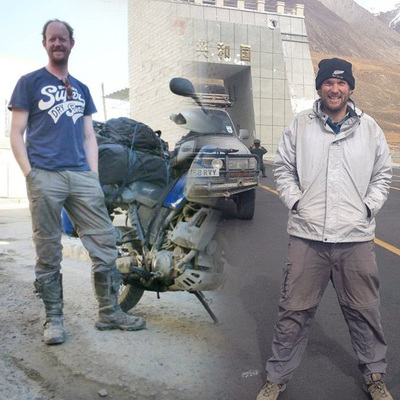 #005 - David Priddis talks about adventuring on 2 wheels and 4, broken clutches and being hunted down by armed border guards in Africa. 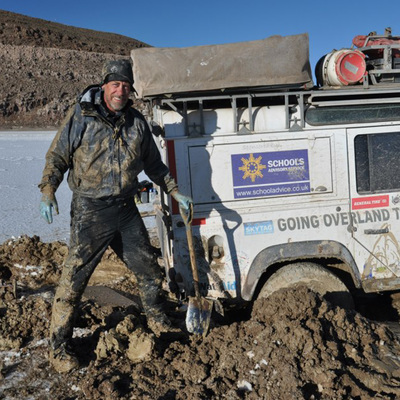 #004 - Land Rover overlander Paul Crittenden talks about getting stranded in a remote Andean farming village for seven weeks, transferable skills from his pre-overlanding days and shifting paradigms. 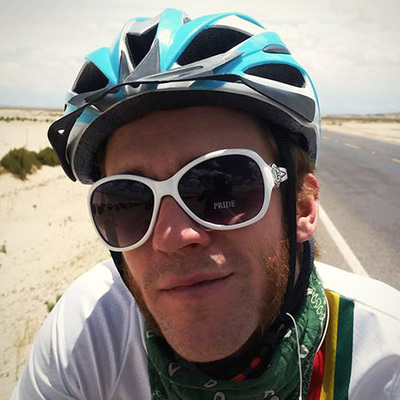 #003 - In this podcast Jack Crisp and I discuss the trials and tribulations of being a solo cyclist on an extended trip. 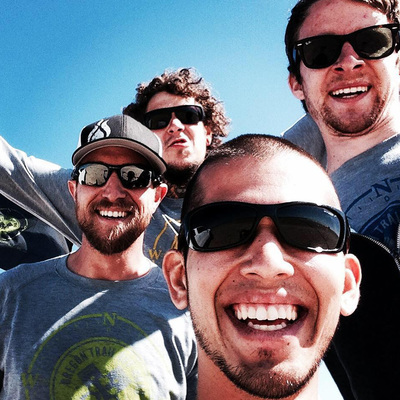 We talk about trip intentions, social media and keeping a diary. 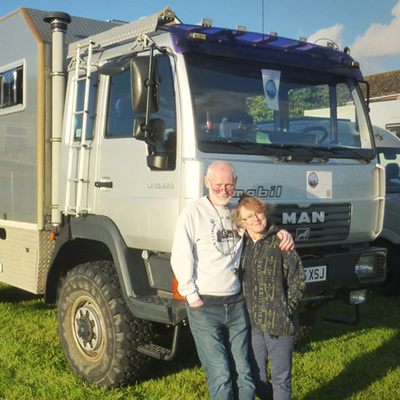 #002 - Stephen and Michele Stewart talk about their worldly adventures dating back to 1969, driving an old Land Rover from South Africa back to the UK via central Afghanistan and much more. 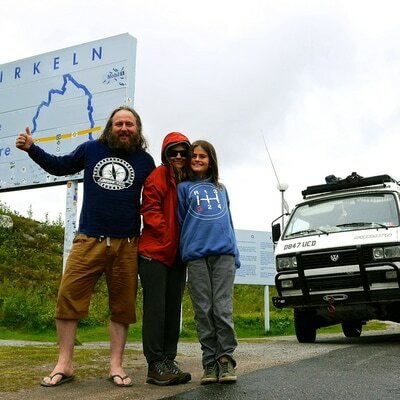 #001 - Andy and Emma from Around the World in 800 Days talk about their world overland trip in their Toyota Hilux Surf, their inspiration, history and their new podcast.